What difficulties and experiences have you had with the justice system? How has this affected you and your families? These questions launched conversations in the nine groups preparing for a Fourth World People’s University (FWPU) in Bolivia. 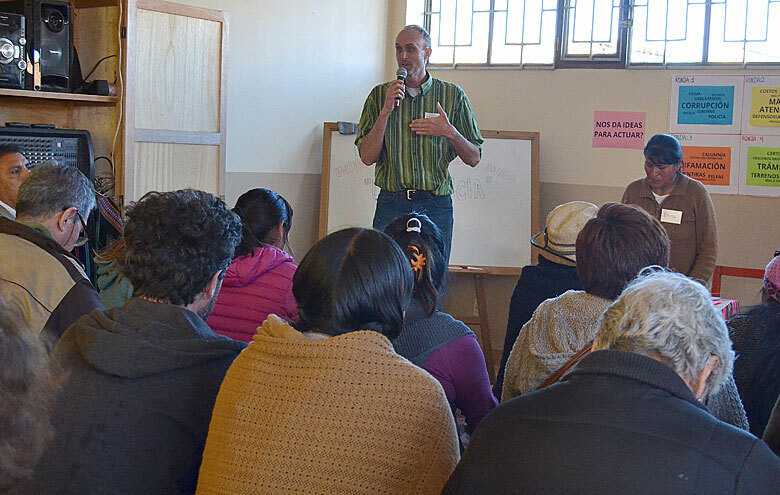 When the event took place in El Alto at ATD’s headquarters, more than 40 people attended and the subject was justice—or the lack of it experienced by people in poverty. The People’s University invited Oscar Cordero, a lawyer, to listen to the more than 40 attendees and then discuss issues related to the justice system that many Bolivian families face in their daily lives. In the preparation meetings people expressed a number of common concerns. These included corruption, defamation, and negative attitudes or lack of attention from police and the entire justice system. These issues became the focus of the FWPU on November 9, 2018. The comments below from FWPU participants illustrate the difficulties that many families encounter when they interact with Bolivia’s justice system. The meeting went on to discuss tools that might enable the justice system to treat people better and more fairly. This Fourth World People’s University encouraged attendees to continue thinking about these issues and to participate in dialogues that allow people, especially those facing extreme poverty, to recognize each other as having important information and knowledge to share with each other.